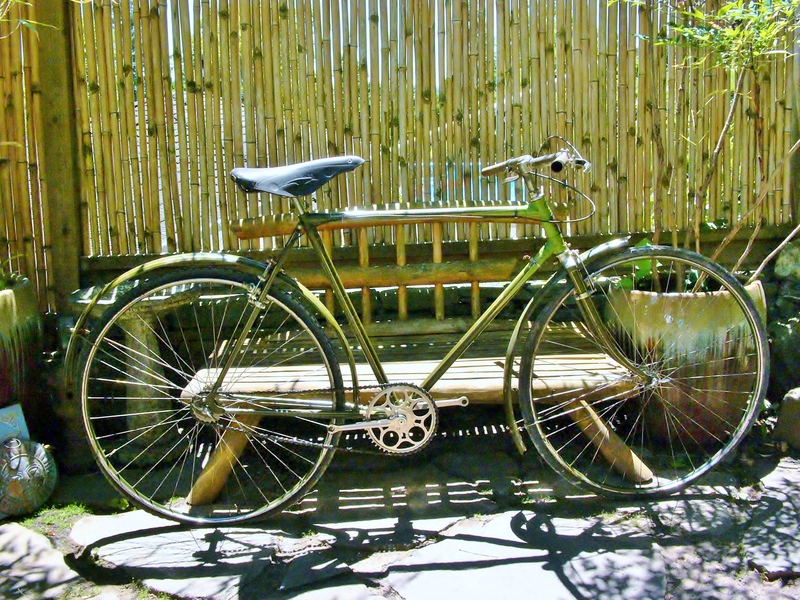 1929 Griffon – single speed with flip-flop fixed/ free hub – restoration complete – contact me for price. 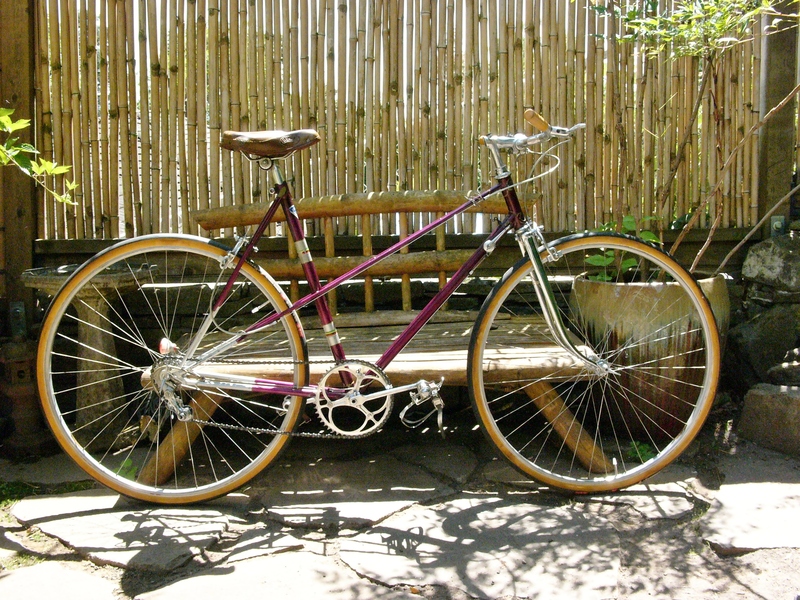 1947 Peugeot Mixte 650b – available for sale. 1947 Camille Daudon 650b Mixte – custom built for Irene Faberge Gunst – in my permanent collection. 1941 Goeland 650b Mixte – restoration underway. 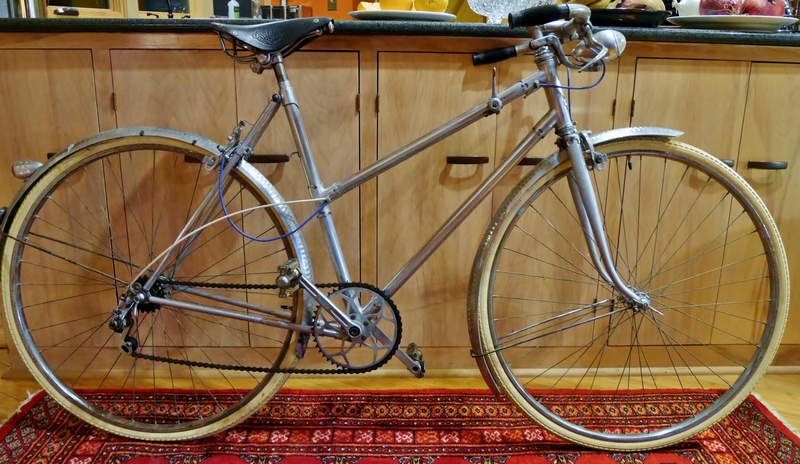 1940’s Mercier Meca Dural (aluminum frame with steel fork) – restoration underway. 1950 Raleigh Sports Tourist Ladies Model – in my permanent collection. 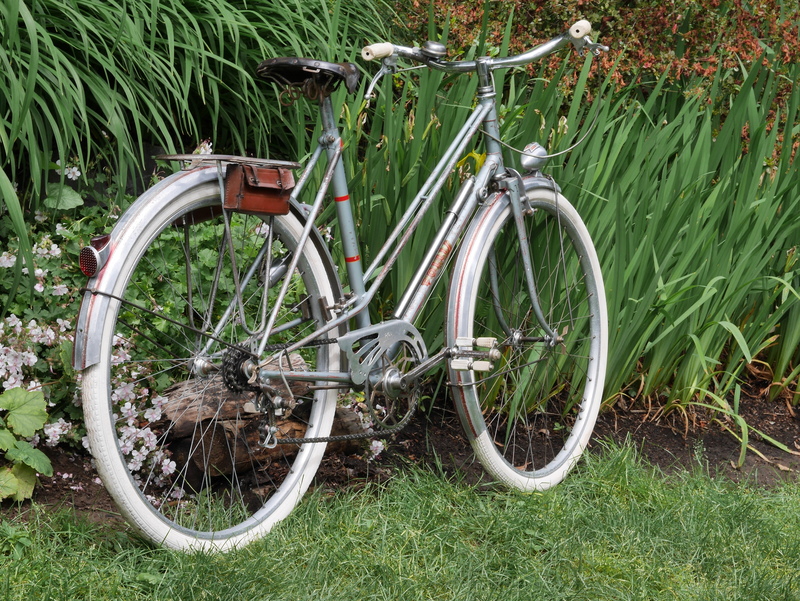 1953 French Mystery Mixte – 700c tubulars, Oscar Egg lugs – contact me for price. 1953 Follis 650b Mixte – restoration underway. Early 60’s Raleigh Rudge – SOLD. 1965 Schwinn American – My Dad’s old bike – in my permanent collection. 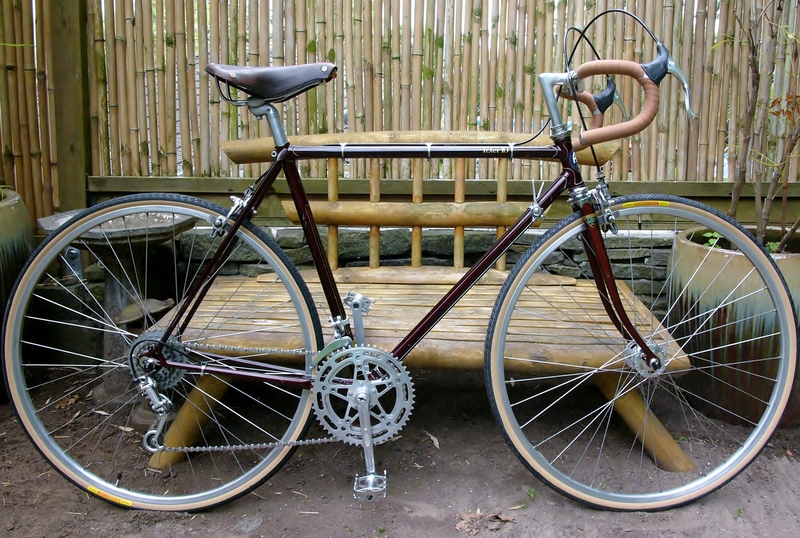 1960’s Raleigh Royale single speed (2 speed) conversion – SOLD. 1970’s Meral 650b Randonneur – restoration in progress. 1972 Mercian – 700c wheels 49 x 51 frame – Reynolds 531 – in my permanent collection. 1973 Jack Taylor Tourist – in my permanent collection. 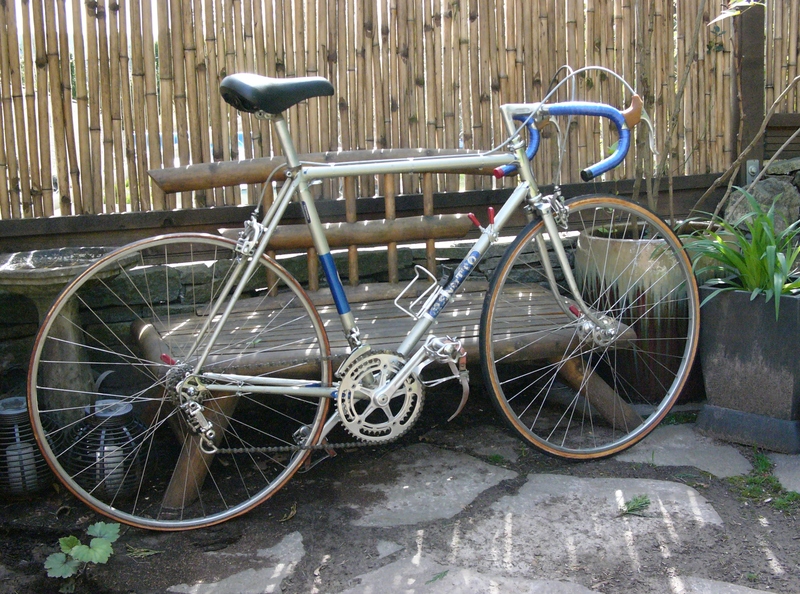 Mid 70’s Benotto -full Campagnolo – original and unrestored – contact me for price. 1977 Jack Taylor Tandem 650b – Maxi Car, Reynolds 531, Campagnolo – unrestored – contact me for price. 1978 Centurion Pro Tour – SOLD. Late 70’s Austro Daimler Inter 10 – SOLD. 1979 Centurion Super LeMans – SOLD. 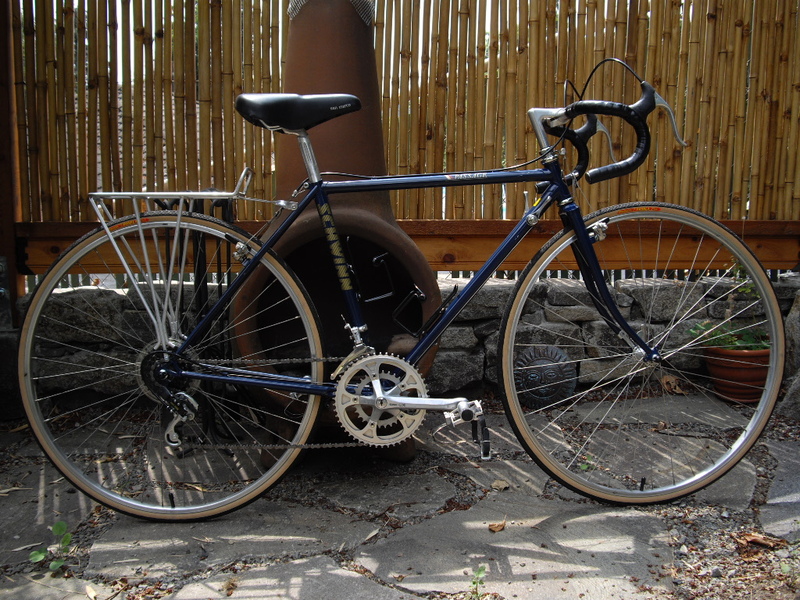 1979 Peugeot Gentleman’s Mixte (extra large frame) – SOLD. 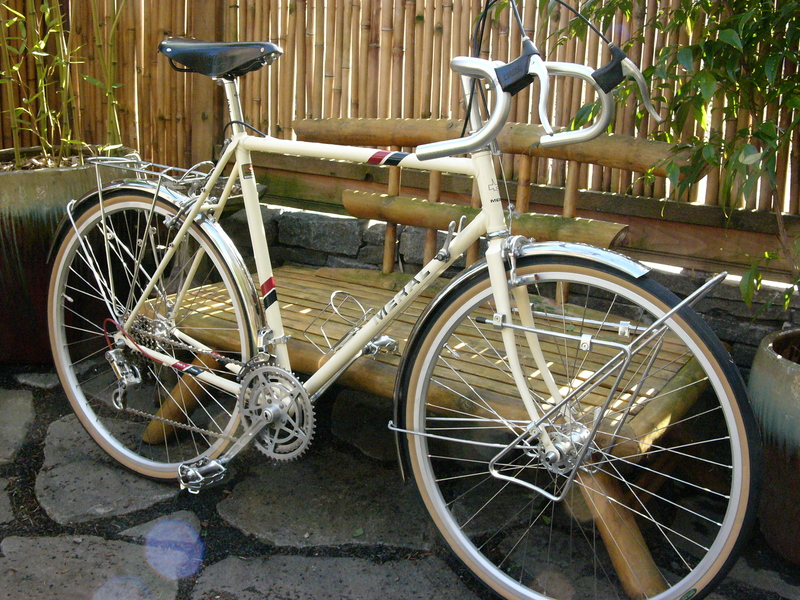 1970’s Peugeot Porteur Mixte – Reynolds 531 – available for sale. 1985 Nashbar Touring Bike – in a friend’s stable. 1980’s Viner City Bike conversion – available for sale. 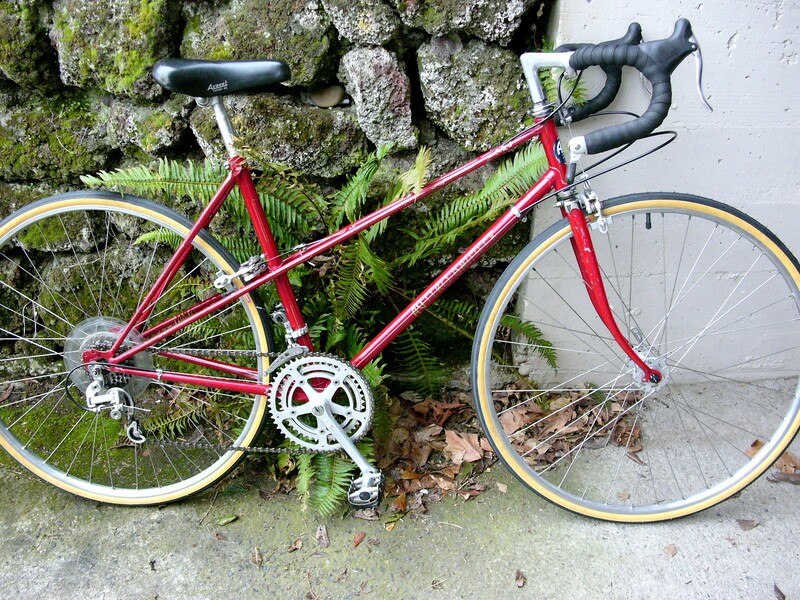 Early 80’s Schwinn Passage – SOLD. 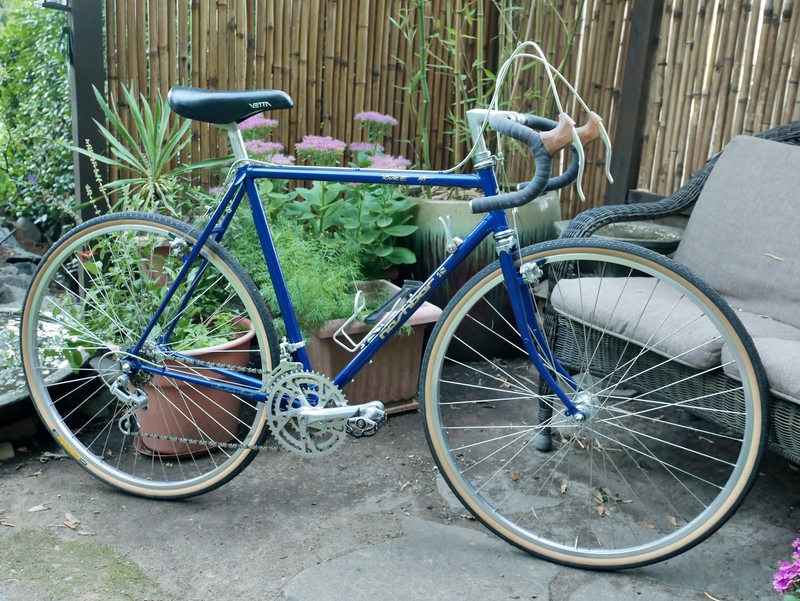 Early 80’s Astro Daimler Mixte – SOLD. 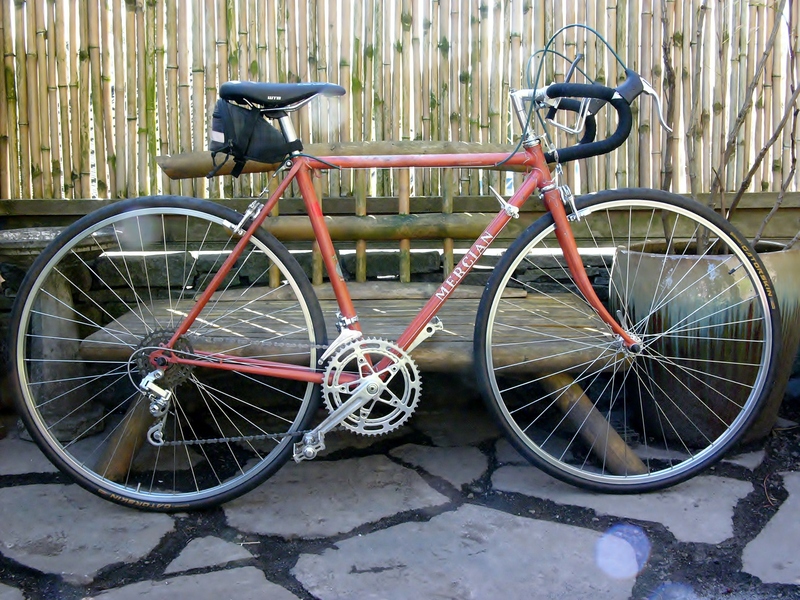 Mid 80’s Panasonic MC 3500 converted to city commuter – sold. 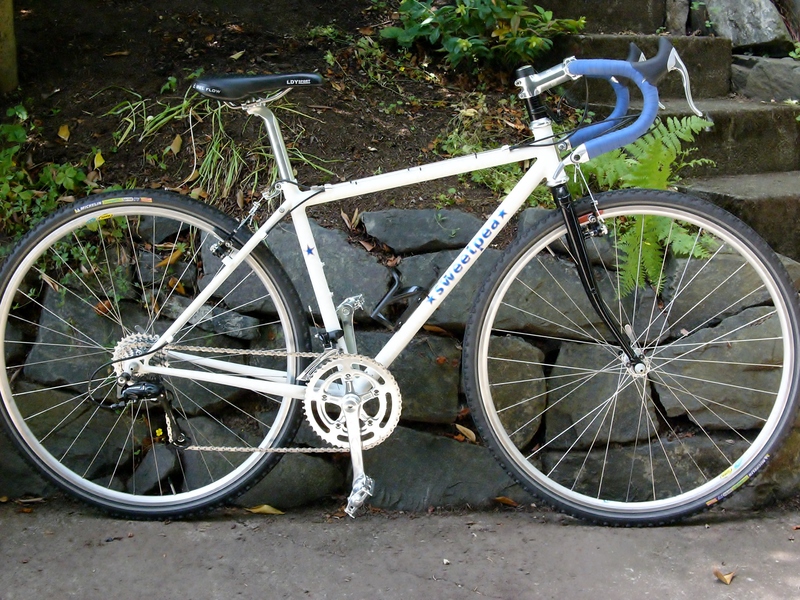 2010 Custom Sweetpea Cyclocross – not a vintage bike but handmade in Pdx by Natalie Ramsland – available for sale. Loved your dad’s old bike. We are vintage bicycle enthusiast. Thanks. Rebuilding the two speed kick back hub was quite an undertaking. Thanks for sharing your site. Thanks for your comments. I appreciate you sharing your FB link! I will check it out. I also love your mandate about recycling and restoring quality bikes to keep them out the landfill and cut back on waste. This should go for cars and most manufactured items as well! While there is a financial motivation to buy vintage, I also prefer to invest in quality, and modern parts are anything but. I have a few questions. What are the handlebars on that lovely Jack Taylor? I would love that bike, or one like it. What is the cost of the 70’s peugeot 531 mixte, and will you be keeping the blue peugeot mixte porter for your own collection? The blue colour is stunning. I had no idea peugeot made such high quality lady bikes, at all. I am always looking for higher end mixtes or step through frames and always told they do not exist. As a tiny person, I have trouble finding bikes that fit, lady bikes usually the only option. Thank you, Heather. Your discerning comments are welcome. The Jack Taylor actually has two different handlebars as shown in two different photos on my site – one in the Gallery page and one on the Why Ride Vintage page. The latter photo shows it’s original French mustache bars which have no rise or drop and a very short “return” as Grant Peterson might say. The other photo shows the bike with new Soma mustache bars installed, with a slight drop and longer “return”. The JT has unusual geometry in that it’s head tube is lower than the seat tube. I am still working out the ergos on that bike and haven’t decided yet what to do about the bars. I will get in touch with you via email regarding the wonderful blue Peugeot. I am away from my shop right now but will be in touch in a few days. I have a lot of ideas about how to set up bikes for smaller riders. Meanwhile, happy riding! Hi! I’m glad you have this site, it’s a little different than some of the other sites I’ve seen. I have a question, is there a such size as a Vintage small 43cm/17 inch Mixte Peugeot from the 1970’s? 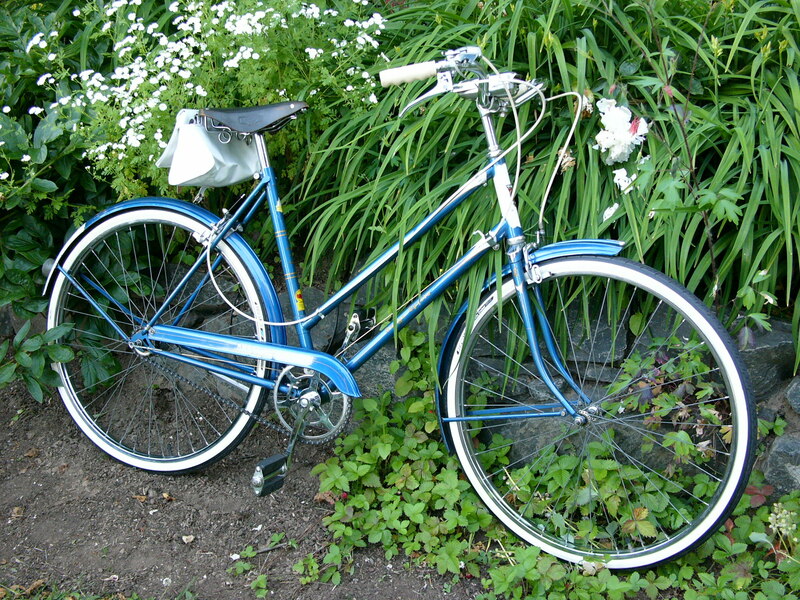 I had a vintage Peugeot mixte in blue that was a 19 inch that I bought at a local bike shop and lost it. 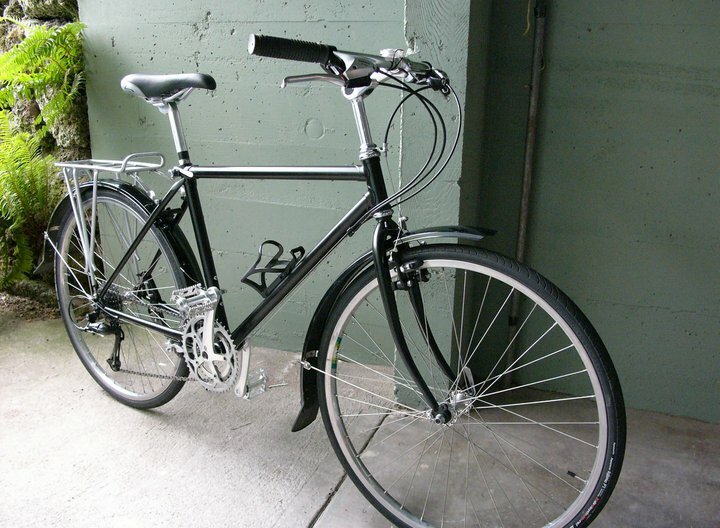 As I’ve gotten older I’ve found I need a smaller frame and I prefer the French made Mixte. Hi Kim, the length of a mixte seat tube won’t have much impact on comfort for a smaller rider, because there is already plenty of stand over height. If you need a small frame, it is the effective top tube length that will make the most difference. Most Mixtes were built with a 53cm top tube, making it an uncomfortable reach to the bars for smaller riders. Hence, Mixtes are actually best suited to riders taller than 5’4″ or so. You can find Mixtes optimized for smaller wheels, and you can also modify the stem and bars to provide a more comfortable ride. Men’s Mixte Peugeot? I had not heard of a “men’s mixte. Wow! How cool is that?! I’m a guy and I love the way the low center of gravity makes the mixte’s handle. Rivendell makes a men’s mixte called the Cheviot (gotta love rivbike’s crazy monikers), but I am not aware of any other modern day men’s mixte’s. 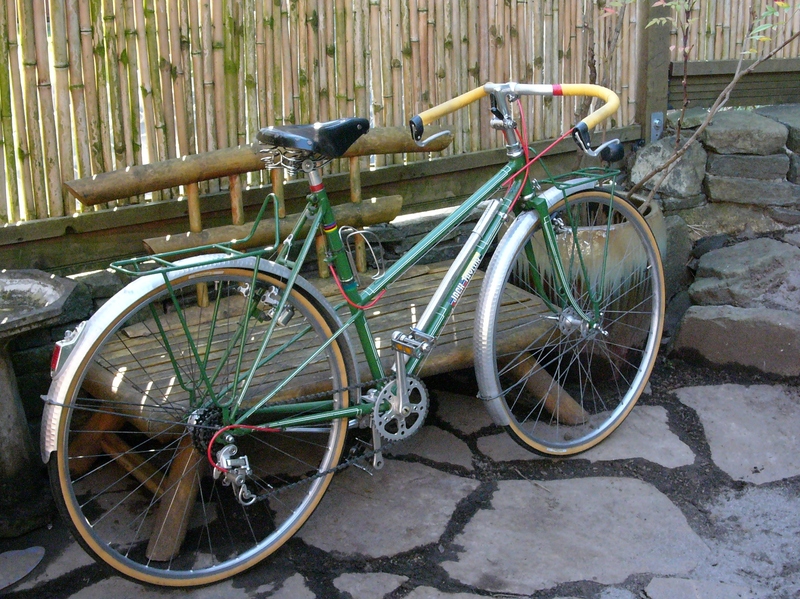 I have found many very large mixte’s among the French marquis’, but mostly built in the 60’s and 70’s. I saw a roadie coming up the street the other day on a carbon bike, and it looked for a minute he was riding a mixte, because of the sloped top-tube! The old manufacturers were right all along. 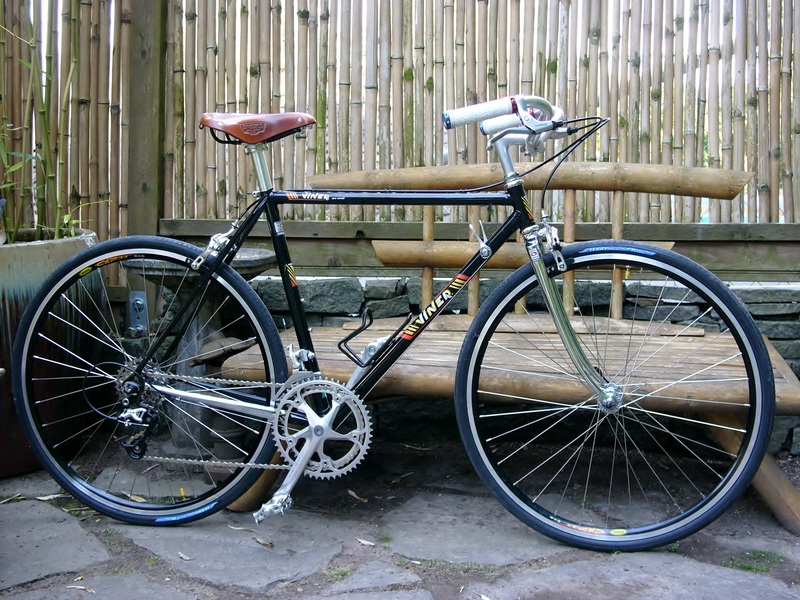 Regarding Rivendell’s name for their mixte, I imagine it is named after the Cheviot Hills which straddle the border of England and Scotland. Really enjoy the website. 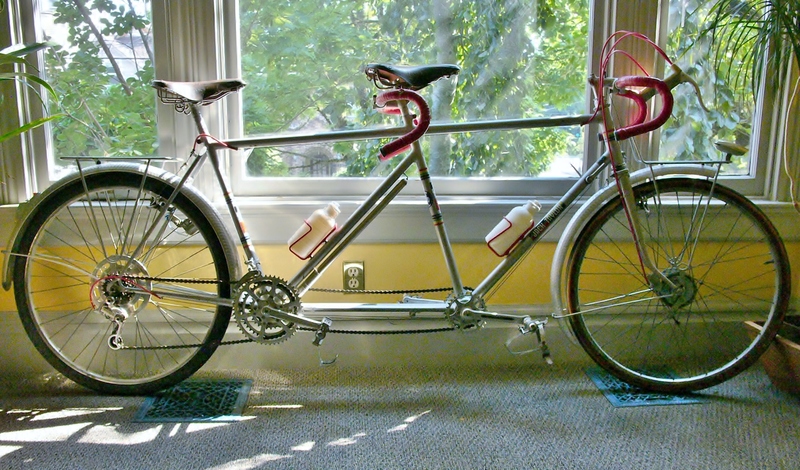 I always considered a mixte to be a lady’s bicycle but you have shown a mixte is for everyone. Interesting insight on the Cheviot name – thanks! I have a 1950s AreoFast is good condition. Hello my name is David Selby I’m hoping you can help me. I remember this bike when I would go to work with my Dad on Saturday mornings when I was 7-8 years old ( I’m 59 now) it belonged to the owners of the company he worked for it was their sons bike. My question is should I just put it up (don’t Luke that idea) or restore it? I live just north of Jacksonville Florida in a little town call Callahan Florida. I would love to here your opinion. My w-mail is dgselb@yahoo.com please help. What is the difference between the Yellow and Red band two speed kick backs.